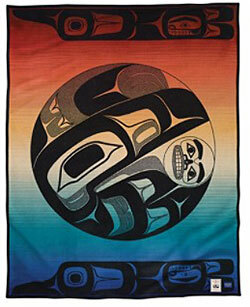 This intriguing blanket is based on a work by internationally renowned glass artist Preston Singletary. Mr. Singletary grew up in the Pacific Northwest – both of his great-grandparents were full-blooded Tlingit Indians. His works explore traditional images and legends of his Tlingit heritage translated into glass. 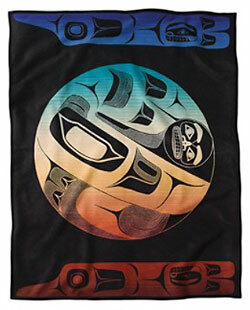 The image on this blanket represents Raven, a shape shifter and trickster who often employed crafty schemes to achieve his goals. In the story, the old chief who lived at the head of the Nass River kept his precious treasures – the sun, the moon and the stars – in beautifully carved boxes. Raven steals the light, and making his escape carries the sun in his mouth. The sun is a metaphor for enlightenment or knowledge. The ombred background shades meet in the center in vibrant colors of sun and light. Mr. Singletary’s artworks are included in museum collections from the National Museum of the American Indian in Washington, DC to the Handelsbanken in Stockholm, Sweden. He is a member of the Board of Trustees for the Seattle Art Museum. 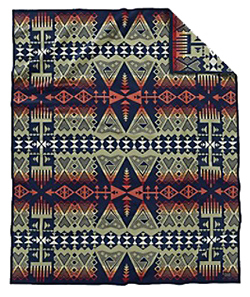 A portion of the proceeds from this blanket will be donated to the American Indian College Fund to help support tribal colleges. Unnapped. Felt-bound. 82% pure virgin wool/18% cotton. Dry clean. Made in the USA. 64" x 80". The Ribbon Dance is the first ritual that opens up the most sacred Seminole ceremony, the Green Corn Festival. The tribeswomen wear traditional patchwork skirts and tunics and swirl ribbons around the sacred fire to renew the flame for the coming year. This blanket captures the energy and vibrancy of the Ribbon Dance and serves as an homage to traditional patchwork design. 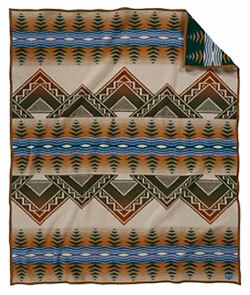 This blanket is a collaboration between Pendleton Woolen Mills and the American Indian College Fund. 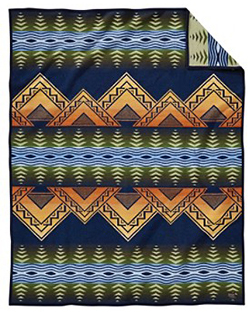 A portion of the proceeds from this blanket will help ensure that young Native students receive the scholarships they need to attend tribal college. 64” x 80”. Unnapped, felt bound. 82% wool/18% cotton. Dry clean. Made in the USA. 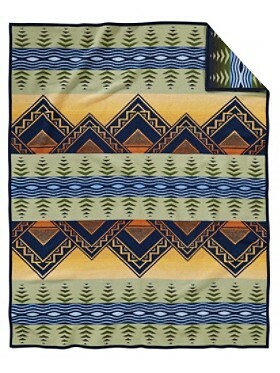 This design is discontinued by Pendleton. We only have one available. Our American Treasures design celebrates the 100th anniversary of the National Park Service, created in 1916 to manage our national parks and monuments. It celebrates the majestic and historic places, and the individuals who have been protecting them for a century. The design's motifs evoke the forests, rivers and mountains under the protection of the dedicated men and women who serve as keepers of America’s natural beauty. Classic geometric patterns remind us of the Native Americans who have lived and cared for the land for so many centuries. From missions to monuments, wilderness to wildlife, our national parks contain American treasures, and Pendleton salutes all who watch over them. 64” x 80”. Napped, felt bound. 82% wool/18% cotton. Dry clean. Made in the USA. 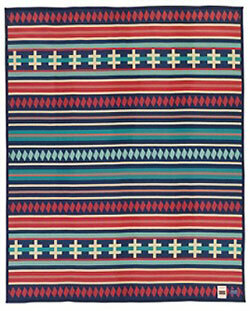 This pattern and color combination has been discontinued by Pendleton. We have one available. Created to honor the 100th anniversary of the National Park Service, our American Treasures design evokes our forests, rivers and mountains, celebrating all who help preserve them. 82% wool/18% spun cotton warp. Dry clean. Made in the USA. 64" x 80". Napped. Felt bound. 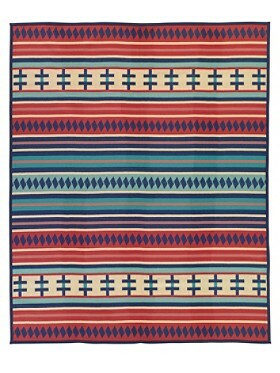 From the Pendleton Heritage Collection, this USA-made wool blanket features a 1920s-era pattern found in the Pendleton archives. The dynamic, intricate design is inspired by the Cheyenne Arrow Renewal ceremony, which sought to strengthen the collective existence of this Great Plains tribe. Reverses for two different looks. 64" x 80". Unnapped, felt bound. 82% pure virgin wool/18% cotton. Dry clean. Made in the USA. 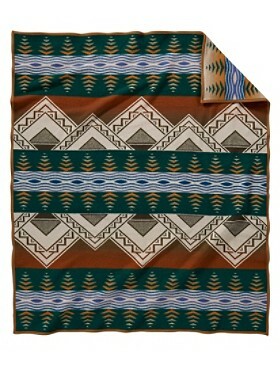 This patten is discontinued by Pendleton. We have one available.